Outstanding. 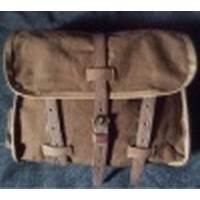 It looks at home on my M1904 Garrison Belt, and securely holds my cell phone, when on horseback. Beautiful and highly functional repro. very nice quality leather and stitching. Nice addition to the M1912 belt. Well made from sturdy leather with good quality hardware, a real piece of history reminding one of the Punitive Expedition and the Banana Wars! Perfect for holding all sorts of small objects. Fast delivery, good quality, Thumbs Up! Good product. I have it on my equipment belt when I ride out and it works well. Oiled up and colored up very nice. I use it for change and keys and it is all I could ask for.